Home Social Do not sacrifice your eyes for computer! It seems the more pervasive the introduction of computers in the workplace and even in the homes of those with eye problems and vision (CVS), or "Computer Vision Syndrome" suffering is increasing. 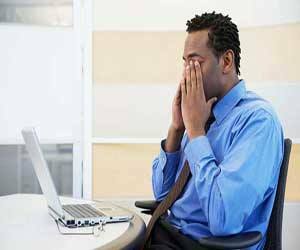 The symptoms of CVS include eyestrain, dry eyes, burning, tearing and blurred vision. May also cause pain in the neck and shoulders, too. In general we can say that CVS eye and vision is a set of symptoms caused by computer work. There are those who work with computers caught almost 4/3 of these symptoms. 1. Try to voluntarily blink. This will cause your eyes with tear-stained surface and not dry. If the problem is severe you can use artificial tear drops. 2. Monitor center should be about 10 to 20 cm below your eyes. This situation not only causes will be lower eyelids and under the eyes are exposed to air. Also reduces neck and shoulder fatigue. 3. Your monitor so that the light does not shine windows or lighting. When working with computers try to draw the curtains and lighting as well as half the typical situation down. Try every 5 to 10 minutes your eyes away from the monitor for 5 to 10 seconds to the far look. This helps relax the eye muscles. It also gives you time to blink your eye surface gets wet. 5. If you have to frequently monitor a page and look (especially in the case typist) may be bored because your eyes have to adjust to change. To avoid this problem, try writing at the minimum distance and level with your monitor. For this you can use copyholder. 6. Monitor distance with your eyes should be 50 to 60 cm. 7. Adjust your monitor brightness and contrast. The brightness of the monitor should be coordinated with the lighting. This is a way to adjust the monitor's brightness to a web page with a white background (like this page) to look at. If you like the white brightness of the monitor is a light source and have it down. Conversely, if the page looks a little gray brightness. 8. Other specifications set your monitor. Quality display images on the monitor depends on three factors: Resolution, Refresh Rate, and DotePitch .Refresh Rate indicates the frequency of renewal of the image on the monitor. Low frequency can be tiring for the eyes and the flicker frequency is very low. Refresh Rate 70 Hz or more is best. Refresh Rate Resolution or resolution of which depends on the density of pixels in the image on the monitor is called. The more pixels, the more detail can be seen from Tsvyz. Resolution Generally, the more the better, but should also be noted Refresh Rate. High Resolution Refresh Rate are sometimes so low that the situation must have both the greatest number. Dot Pitch The image sharpness is effective, and the number is less than sharp image. Most monitors have a dot pitch between 25/0 to 28/0 mm. 28/0 mm or less desirable number. Refresh Rate and Resolution on the Windows Display Properties setting, but it can not configurable dot pitch. 9. If, despite compliance with the above recommendations are still experiencing symptoms of glasses can be used because it is sometimes difficult to see average. We normally see lower than average because we use more often or to look at distant objects or objects close. But the computer monitor precisely placed at a distance from the eye to see average. Suitable Computer to get glasses to your eye care practitioner. 10. When working with a computer, try to keep your neck straight and shoulders back as manager. When working long hump with neck and shoulder pains can be computerized. It took her back to the chair. The height of your chair so that the soles of the feet on the ground and your knees are at 90 degrees. Keyboard and Mouse should be below the elbow and reach your hands.